1. House of Holland in Royal Explosion. 2. Elegant Touch Express in Bright Marble. 3. House of Holland in Tie Dye For. 4. House of Holland in Block Heads. 5. Candy Dip in Blueberry Crumble. 6. House of Holland in Sweet Tooth. 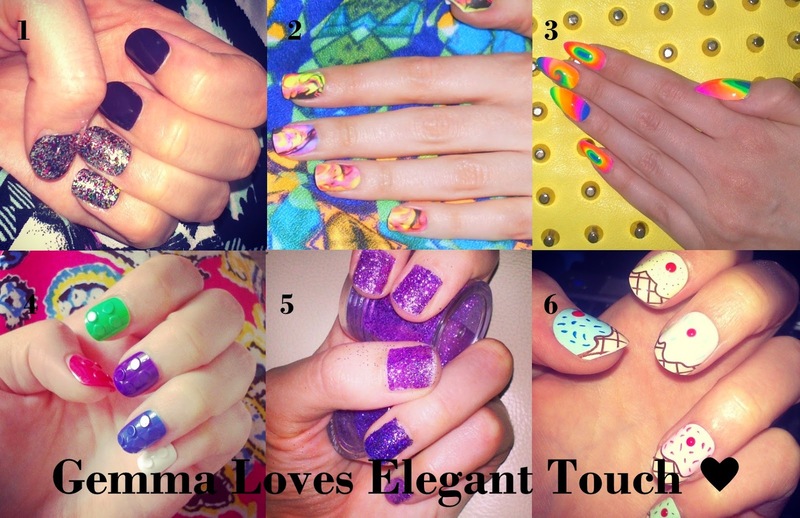 I became quickly obsessed with the fabulous collections by fashion design legend Henry Holland, so you can imagine I was jumping for joy when Elegant Touch announced that they were collaborating with nail art queen, Lily Allen...yes she of beautifully bejewelled and quirky printed nails. I just knew it was going to be some serious nail candy and I was right. The Lily Loves Nails collection pays homage to Lily's hometown of London and are inspired by her trademark high fashion meets street style. The seven different oval and stiletto shaped designs are named after song titles and themes from Lily's albums, and show the flair she has for nail art - confident, quirky and cool. Not for the shy and retiring girl, the Lily Loves collection features explosions of glitter, metallic shapes, matte prints, jewels and London landmarks - perfect for adding a pop to any outfit! Apply with glue or use one of the awesome Elegant Touch Super Adhesive Tabs if you like to switch up your manicure often. The nail art queen herself says: "I'm thrilled to be collaborating with Elegant Touch on the Lily Loves Nails collection. It's a dream come true. 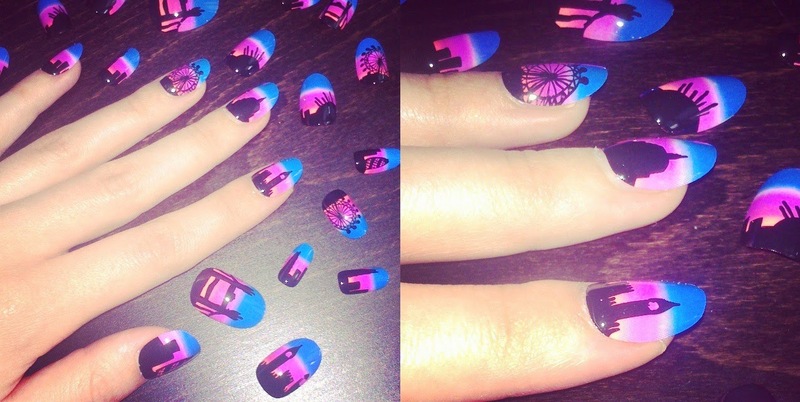 nail art is a huge part of my life and a vital part of my personal style. I love changing-up my nails, sometimes 3 or 4 times a day, and I'm so excited to bring out this collection so you can choose your favourites and do the same!" Prices range from £6.99 to £8.99 (quite the bargain for 10 days of fabulous nails) and are available now through the Elegant Touch website and in Superdrug stores. Thank you Elegant Touch, for another fabulous collection. What does everyone else think of the Lily Loves Nails line? *Nails provided to me by Elegant Touch for the purpose of this review, all opinions are my own. They are definitely worth a try Sam. I think iti s all about a good glue, whenever I use cheaper nails, I always use Elegant Touch glue. You also have to make sure you follow the instructions and prepare your nails to get the best wear out of them. I love the blue and pink ones - ten days seems like a long time; I hope they actually last that long. If you prepare your nails properly you will get good wear out of them. It also depends how fast your nails grow I think. I have fast growing nails, so after about 7 days they are ready to come off, but they are better than any other brand I have tried. Man, I'm not into nail art, but damn your posts will most definitely make me a newbie fan! :D I looove all these crazy nails! These are all so beautiful Gems, love all the cool and unique designs, can't stop admiring them! And they last 10 days? Oh my goodness, it doesn't get any better than that :). I love the shape of the ones you picked, I can never shape my nails in that perfect oval shape so these would be a great alternative. I like you would have chosen the London skyline ones. How fun. What cool nails!!! Would you like to follow each other on GFC?! Let me know and follow me on my blog, I will follow you right back on both GFC and Bloglovin!